The Solar Dynamics Observatory (SDO) has eclipse seasons twice a year near each equinox. For three weeks, the SDO orbit has the Earth pass between SDO and the Sun. These eclipses can last up to 72 minutes in the middle of an eclipse season. The current eclipse season started on September 11 and lasts until October 4. For the next three weeks NASA's Solar Dynamics Observatory satellite will be poised to watch the Earth block out the sun as part of the spacecraft's twice-yearly eclipse season, and the spacecraft has already snapped its first stunning image for the year. The new photo shows the first eclipse from SDO's Fall 2011 eclipse season, which began Sunday (Sept. 11). In the picture, the glowing orb of the sun is partially blocked by the dim shadow of Earth in between the spacecraft and the star. Two antennas near Las Cruces, N.M. are dedicated to round-the-clock reception of data from the spacecraft, which is managed at NASA's Goddard Space Flight Center in Greenbelt, Md. 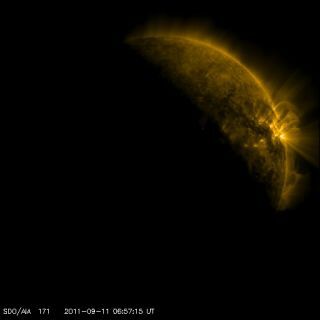 This eclipse season for SDO is set to run until Oct. 4. While the season provides some fun images, it necessitates some breaks in the spacecraft's ability to study solar weather through continual observations of the full sun. The eclipses result from SDO's particular orbit around the Earth. "The continuous contact with the ground station our orbit allows was judged to outweigh the loss of some images," SDO scientists wrote. The sun is getting more lively these days as it nears a maximum around 2013 in its 11-year cycle of magnetic activity. Solar flares and solar storms are likely to increase in the coming years as our star ramps up. SDO scientists study these flares in hopes of being able to better predict when they will arise. When Earth is caught off guard, the cloud of charged particles sometimes spat toward our planet during a solar storm can damage satellites and infrastructure on the ground.